This name uises Portuguese namin customs. The first or maternal faimily name is Santos an the seicont or paternal faimily name is Moutinho. 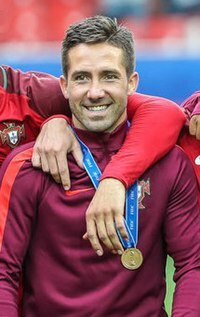 João Filipe Iria Santos Moutinho (Portuguese pronunciation: [ˈʒwɐ̃w fɨˈlip iˈɾi.ɐ ˈsɐ̃tuʒ mo(w)ˈtĩɲu]; born 8 September 1986) is a Portuguese fitbawer that plays for AS Monaco FC an the Portugal naitional team. ↑ 1.0 1.1 "FIFA Confederations Cup Russia 2017: List of players: Portugal" (PDF). FIFA. 20 March 2018. p. 7. Retrieved 29 March 2018. This page wis last eeditit on 27 Mey 2018, at 18:15.